Before we had planted a single vine we decided we wanted to put up an owl nesting box to support the Somerset Barn Owl Project. As barn owls feed on small mammals found in open tussocky ground, we thought that a vineyard might prove an ideal hunting ground. We invited conservationist Chris Sperring of the Hawk and Owl Trust to Limeburn Hill to give us some advice on placing a nestbox and making it as attractive as possible to potential occupants. Chris suggested we place a box in one of the large hedgerow trees, facing away from the prevailing south westerly winds with an open space in front of the box to allow the owls to fly in and out. He also recommended keeping areas of long rough grass around the field which would be ideal habitat for voles and mice. One of his most enchanting tips was choosing a rough barked tree trunk so that any owlets that fell out of the box could use their claws and stubby wings to climb back up again. 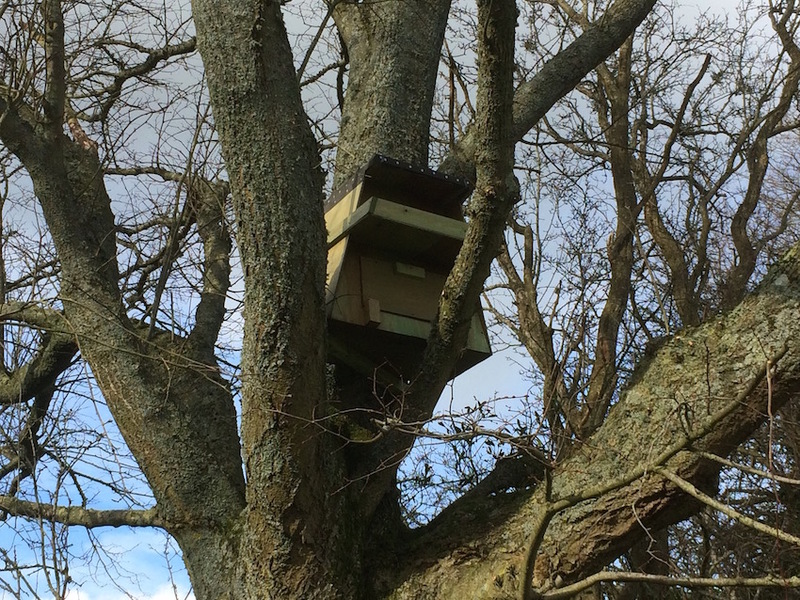 Georgina’s father John, 86 and a retired civil engineer, painstakingly built the box in his garage in Dorset following a sheet of instructions from the Barn Owl Trust. It was quite an undertaking as the box is 75cm high, wide and deep, and surprisingly heavy with it. It has an inspection hatch at the front for clearing out debris over winter and a landing tray. It has now been installed in a mature lime tree overlooking the rows of Pinot Noir grapes. Barn owls have been in decline since the late 19th century, most recently because of agricultural intensification and increased use of pesticides. Numbers declined from 12,000 breeding pairs in a 1932 census to 3,800 in the 1980s 1. Recent estimates suggest there are now 4,000 pairs and that numbers are beginning to stabilise but the barn owl remains on the Amber list of conservation concern. As about 80% of pairs are thought to breed in boxes then we hope John’s ‘Owl Hootel’ will one day make a difference.